Izentis offers both amplitude and phase transmission gratings. A grating where light passes through an opaque surface with multiple slits is known as an amplitude transmission grating, since the light varies as a periodic step function in amplitude. A more efficient transmission grating has a periodic structure that alters the phase of the light without blocking the light. (The efficiency is defined by the ratio of light intensity in a given non-zero diffraction order to monochromatic incoming light.) These gratings are known as phase gratings. An example is periodically-etched glass, such that the optical path difference between the etched and non-etched regions is half a wavelength. Such a design suppresses the zeroth order which vastly improves efficiency. Please contact us for more information and quotes on transmission gratings. 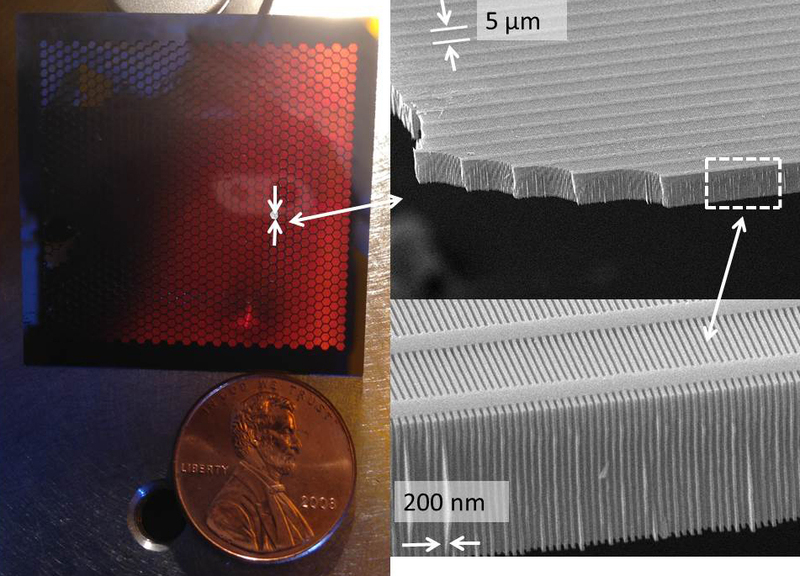 Photograph and scanning electron micrograph of a freestanding transmission grating fabricated by Dr. Bruccoleri. This is an example of an amplitude grating for soft x-rays. Scanning electron micrograph taken of the bottom surface of a freestanding transmission grating fabricated by Dr. Bruccoleri. The cross supports can be made narrower for applications that require higher x-ray throughput.